Asia, with its economic dynamism and potential, has been an important engine for world economic growth. China is an important part of this “Asia miracle”. Over the past 40 years since reform and opening up, China has not only made tremendous progress at home but also deepened cooperation with other Asian countries to write a new chapter for regional prosperity and development. With China becoming the largest trading partner of 16 Asian countries, the interests of China and Asia are increasingly integrated and the future of the two are ever more closely shared. The development of China and the rest of Asia is a story of how openness brings progress, and openness and cooperation is the only road leading to prosperity. Therefore, Asian countries should stay committed to open regionalism. In recent years, deepening economic integration and thriving regional cooperation in Asia, coupled with extra-regional cooperation across the board with outside countries and international organisations, have prompted negotiations of all types of free trade arrangements and required them to be open, transparent, inclusive and conducive to trade liberalisation and facilitation. To increase bilateral and multilateral trade with other countries in Asia, China is advancing the negotiations on the Regional Comprehensive Economic Partnership and on free trade and investment agreements. China has also offered the Belt and Road Initiative (BRI) as a public good for the world. The BRI follows the principles of equality, openness and inclusiveness. It aims at creating not an exclusive coterie but a big family that is open to all countries. It is not China’s one-man-show but a chorus of all its partners. Next year, the second Belt and Road Forum for International Cooperation will be held, which will be an opportunity for all willing partners to share their ideas about how to make the BRI work better and deliver more benefits to Asia and the whole world. The world economy needs to be open but surging protectionism and unilateralism and looming trade war have been a cause for grave concern. Under this circumstance, China stays committed to upholding the multilateral trade regime with WTO as its core, opposing protectionism of all forms, supporting the role of G20, APEC and BRICS and promoting more fair and reasonable reforms in the international trade system. China never seeks development at the expense of other countries. At the same time, China stays firm in safeguarding its sovereignty, security and development interests. Against the trade bullying of the US, China has made it clear that China does not want a “trade war” but is not afraid of US threat or pressure. China always believes that in China-US relations, cooperation serves the interests of both and conflict neither. Sound and steady development of trade and economic relationship is in the interests of the people of both countries, and meets the common aspiration of the international community. As a display of sincerity in opening its market to the world and sharing its development benefits, China hosted the first-ever International Import Expo in Shanghai in early November. Going forward, China will not close its door. Instead, it will open its door wider to the world and make its market more investment friendly. Openness facilitates a global vision. Since the beginning of the 21st century, globalisation has led to a highly complementary and deeply integrated economic and trade system where the endowments and strengths of different countries are fully leveraged through market competition and selection. This is an irreversible trend. Only those with a global vision and willing to open up could seize this trend and create a brighter future. To build a “global Britain”, the UK launched a new Export Strategy recently, announcing that it will top G7 in the percentage of export to GDP and regard Asia as an important part of this strategy, as is shown in its “All of Asia” policy. The mutually beneficial cooperation between a Britain outside the EU and Asian countries, including China, will enjoy a promising future. 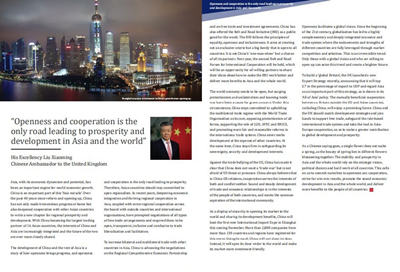 China and the UK should match development strategies and join hands to support free trade, safeguard the rule-based international trade system and take the lead in Asia-Europe cooperation, so as to make greater contribution to global development and prosperity. As a Chinese saying goes, a single flower does not make a spring, as the beauty of spring lies in different flowers blossoming together. The stability and prosperity in Asia and the whole world rely on the strategic vision, political choice and hard work of all countries. This calls on us to commit ourselves to openness and cooperation, strive for win-win results, promote the sound economic development in Asia and the whole world, and deliver more benefits to the people of all countries.